Traders selling magic mushrooms could be jailed despite the fact it is legal to sell them in their natural state, the Home Office says. 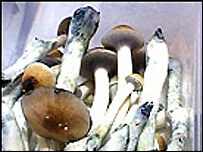 It is only illegal to possess or supply magic mushrooms that have been "processed", such as frozen or dried. Numerous online and high street traders have begun operating in recent months. But the Home Office has looked at the law and now believes "if fresh magic mushrooms are packaged as a product and are offered for sale that is unlawful". A Home Office spokesman said: "It is an operational matter for the police whether or not to initiate a prosecution. If they decide to do so, it would then be a matter for the courts to determine whether any misuse of drugs offence has been committed". Magic mushrooms contain the substances psilocin and psilocybin, and these are controlled as a Class A drugs in "processed" mushrooms. People convicted of supplying them could be jailed for life and face an unlimited fine. A possession conviction could earn seven years in jail and a fine. National Drug Prevention Alliance director Peter Stoker said that eliminating magic mushroom trading would be "a move in the right direction". 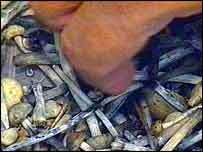 "We need to look at [magic mushrooms] in the same way as other drugs of abuse," he said. "With any kind of intoxication you have got risks of accident either to the person involved or to other people and that has got to be a health and safety issue. "But the main thing is that it is the thin end of the drug abuse wedge. It preconditions people to getting their highs and kicks in life by putting toxic chemicals inside themselves." But Chris Territt, business manager of magic mushroom retailer Psyche Deli, said: "Whilst the government is moving to relax the laws on cannabis in order to free up police time, this seems to be a contradictory move. "We would obviously welcome regulation or licensing to bring the industry up to recognised standards, but a total ban would be incredibly draconian. "We do not sell to under-18s and we give all our customers all the advice they need to enjoy mushrooms in a responsible way." He added that Psyche Deli had received a ruling from Customs and Excise saying that the sale of fresh psilocybe mushrooms was liable for VAT. "If the government is taking 17.5% of every transaction we make, how can they say our product is not legal?"